This recording consists of 4 tracks. Was born 10 January 1923 in London. Mentions going to very good grammar school in London until 1939 when war started. Mentions being bombed in 1940 and moving to Brentwood, Essex in that year. Mentions living in Brentwood for 10 years during which time she was married in Brentwood Church. Mentions working in Brentwood and later at Marconi in Chelmsford. Mentions birth of daughters Penelope (1945) and Anne (1947). Mentions moving back to London, where husband worked, in 1951. Mentions that girls were educated in London. Describes decision to move to "Suffolk, by the sea if possible" after death of husband in 1977. Describes arriving in Aldeburgh in 1978, and not wanting to work in an office again but that she would "far rather do something in the hotel line". Describes offering Bed and Breakfast and evening meals in her own house. Mentions this was a very happy time. Mentions being asked to join various Aldeburgh societies. Mentions becoming Life Member of the Aldeburgh Society in 1979 and serving as its secretary for several years. Mentions that she joined the Women's Institute as soon as she arrived in Aldeburgh and that she is still a member, having performed all of the various offices in the WI. Mentions being elected to Town Council and serving two terms as mayor in 1995 and 1999, each for one year. Describes the work of Mayor as very interesting but "much harder work than most people realise". Mentions learning a tremendous amount about Aldeburgh and its people during this period. Remarks on having met a lot of people when she first joined the WI, and that she is still friendly with many who were members then, describing them as having "grown old together". Describes how, because she is a widow, her daughters were joint mayoresses and how they assisted her whenever they could, calling them "absolutely marvellous". Mentions that she received a tremendous amount of help from two people in particular, the Town Clerk Andrew Harris and the Serjeant at Mace Charlie Walker. Describes how she made many visits while mayor including twice to Bury Cathedral for services during each mayoral term and to Wattisham Aerodrome. Comments that there were "so many I really couldn't tell you without looking up my diaries for those times". Describes how she was a regular worshipper at Aldeburgh Church for quite a number of years but that she no longer attends. Says she has not lost her faith but for various reasons does not now want to go. Describes how the vicar when she first came, Canon Oram, was succeeded by David Hutchinson who was "a really super vicar". Describes how he helped her greatly and gave her comfort and guidance at a time when she was extremely upset because her great-nephew who lived in Wales had committed suicide. Describes how in 1979 her sister-in-law who was the Meals on Wheels area organizer in Carmarthen met Avril Howes, the Aldeburgh area organizer, at a conference and suggested Peg might do voluntary Meals on Wheels delivery. Describes how as a result she started delivering Meals on Wheels in Aldeburgh and went on doing so for 22 yrs. Describes how when she reached 80 years old she found she was delivering meals to people who were considerably younger than her, so decided to stop at that point. Remarks that "when I was 80 I stopped quite a few things". Mentions anecdotes of various Meals on Wheels incidents: going to a locked and curtained house to deliver a meal, getting no answer and becoming concerned about the occupant who, when doctors arrived, was finally awakened and proved "sprightly and happy". Describes how she found a lady in a house on Crag Path in distress with her leg covered in tiny plasters - the explanation being that cat had got in to the house and in following it upstairs the lady and fallen and grazed her leg badly, but had no large plasters. Describes how she put a clean tea towel on the grazes and phoned doctor who came round and dressed it properly. Describes how on the anniversary of D-Day a man wanted her to stay and talk because he was so upset, since all the stuff on TV and radio about D-Day reminded him of when he was in the Navy and had seen his brother blown up on the ship next to him. Describes how she said to her companion afterwards that now they must go like the wind because there was such a limited time to complete the deliveries, but thought that when someone like that needed comfort they should provide it. 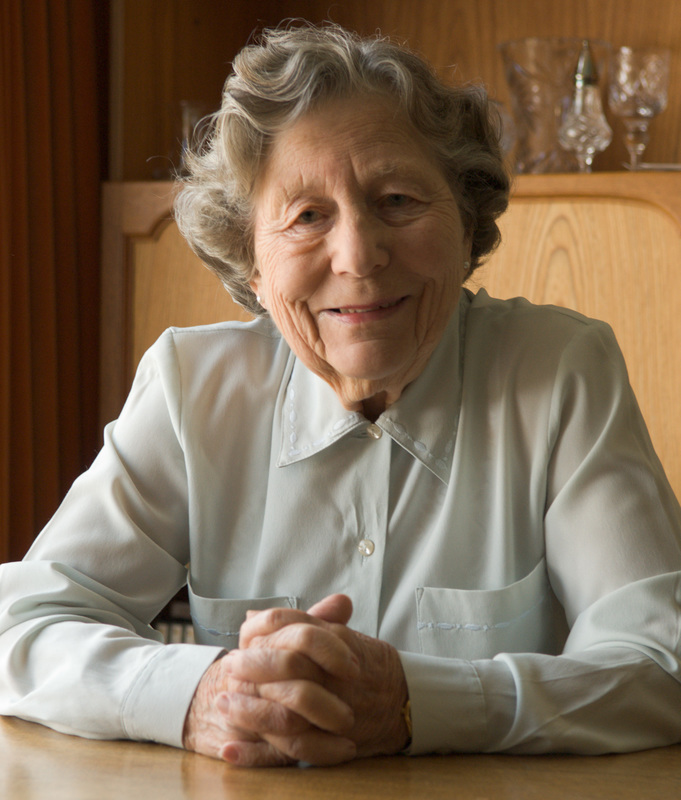 Describes how she has always had students from Aldeburgh Music to stay, and enjoys doing so, because "now that Aldeburgh has a very ageing population it is absolutely lovely to have young people in the house". Remarks that she looks forward to the students staying just as she does having the young people in her own family to visit her, especially her great grandsons. Describes the campaign to turn the old Aldeburgh generating station into a community centre. Mentions that while walking she often looked at the generator station and thought what an awful waste it was because it was used as a dump, and that it would make a splendid community centre. On a walk met a man who had applied to the Council to use it for a carpet bowls club and been refused. He said to her that since she was on the council she should do something about it so she spoke to the Chairman of Suffolk Coastal District Council who agreed. Mentions that permission had to be obtained from the Secretary of State so that the transfer "took forever". Remarks that sadly the man who suggested it, Vic, died before the change was completed. Describes how she organized a dinner in the White Lion and with the proceeds had the building surveyed "much to the disgust of one or two Councillors", but persuaded the majority of town Councillors that it would be a good idea to do something with the building. Mentions that the Community Centre came about only after many years and a lot of fundraising. Describes starting the 100 Club and how to date the Club has given £30,000 to the Trust which was set up in order to apply for Lottery funds. Mentions that other things done for fundraising included jumble sales, car boot sales, a Gilbert and Sullivan evening, and volunteers from Aldeburgh abseiling down the side of Ipswich Hospital. Mentions that a Lottery grant of £95,000 was eventually achieved but that she was not involved and other people had to work very hard to get it. Comments that the building was virtually worthless when taken over by the town Council but is now worth about half a million pounds. Mentions that it cost the council absolutely nothing because of the hard work by fundraisers and by volunteers, "marvellous chaps", who cleared out the building which was a "mucky, horrible job". Mentions that she and Joyce Cook used to take the men bacon and cheese butties and make them tea and coffee each Saturday morning while they were working. Mentions that from the time she first spoke to Suffolk Coastal Council Chairman to the time the Community Centre opened was about 12 years and that it "did not happen in the blink of an eye". Remarks that it was enjoyable in some ways but hard work in others, including getting over on to King's Field by seven o'clock in the morning to set up a stall for car boot sales. Mentions that she had a lot of help from local people who were very generous and that she "couldn't possibly have done it on my own". Mentions that Centre was opened by the Princess Royal in April 2007 but that she was unable to be there because she was in hospital. Describes how she had just been honoured with the MBE and that when she received it later it was the Princess Royal who presented it "so I was obviously meant to meet her". Describes going to Buckingham Palace accompanied by her daughters and brother. Mentions that when her citation read out mentioning Aldeburgh the Princess Royal said PR said that she did not go there often but had been there recently. Remarks that she reminded the Princess Royal of the reason for her visit. Mentions that the Princess Royal spoke to every one of the 120 participants for what her daughter Penelope reckoned was about 45 seconds each. Mentions that she found the palace quite daunting but that she relaxed when she knew it was the Princess Royal she was to meet because "I felt we had a point of contact". Mentions that she did not wear a hat but "a ribbony thing in my hair" which her granddaughters had decided she should wear. Mentions that she wore a suit and that according to the label the colour was foxglove. Remarks that there were no drinks or refreshments but except jugs of orange juice and bottles of water for you to help yourself if you wanted to. Mentions how on coming to Aldeburgh she joined a Keep Fit class which took place in the Church Hall. Mentions that she had done keep fit classes in London for many years and that she thinks she has now done a weekly keep fit class for about 45 years. Describes how she now leads the classes and as she is not a qualified teacher she just gives tips on how to it. Mentions that they have a tape recorder with music and that most of the music is by pianist Charlie Kunz. Mentions that she also runs a Whist Drive which she has done for many years and that she has recently started a Scrabble group which is going fairly well. Concludes interview by saying, "If I stop I shall get old".